An RV vacation is a step up from a tent vacation. You have a soft bed, a stovetop of some kind, and a non-public shower. This might sound like the makings of a dream vacation, but there are a few less appealing details that you’ll need to think about when planning your RV campground vacation at Shasta Lake. This, my friends, is a very important consideration. You don’t want to smell sewage nor do you want to see it backing up in your RV toilet. That could spoil an otherwise idyllic vacation very quickly. 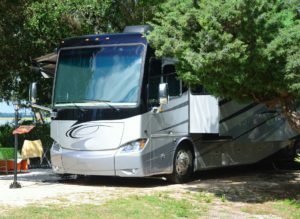 Most RV campgrounds provide partial hookups, which include water and electricity, but only some provide full hookups, which include sewer too. If an RV campground doesn’t provide sewer hookups, you will need to find out where they have the dump station. Know how much your RV holding tank can hold. On the average, tanks can handle a family’s gray and black water for about three days. What amp of electric power do they provide? In campgrounds where they provide full or partial hookups, plan for there to be a possible difference in the amperage of electricity that your RV uses and the camps provide. Most RVs use 30-amp electricity, especially smaller RVs, such as pop-up campers and travel trailers. Because of that, it’s most common for campgrounds to provide 30-amp electric power. 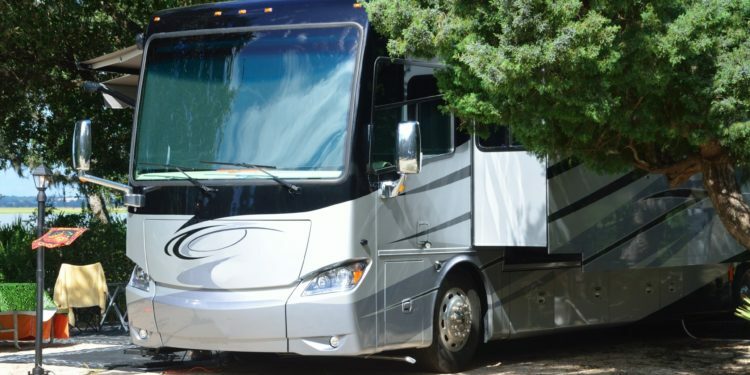 Larger RVs, such as motorhomes and fifth-wheels, may require 50-amp electricity. You can adjust the electric power up or down by purchasing an amp adapter at your local home goods store. Be aware of how much amperage each appliance in your RV uses and make sure you stay within the amperage limit of your electric hookup. Going over can damage your appliances. Are you hoping for a cool retreat from your crazy life? Most vacationers are. If you find a shaded lot available at the campground, rent that one—even if it’s a bit higher priced than a non-shaded lots. Unless you’re planning to do dry camping (i.e. camping without hookups), you’ll be running your air conditioning—and your electricity or generator—a lot more. In the end, you may save just as much by paying for a cooler spot with natural cooling abilities. 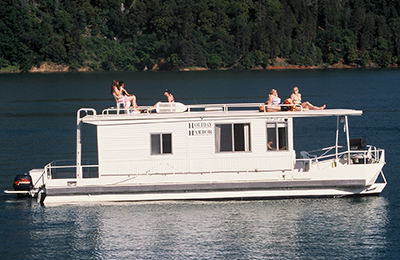 Taking your vacation to an RV campground at Shasta Lake is sure to make your summer memorable. For one, the campsites at the Holiday Harbor campground bring the advantages of full hookups and shaded lots. That means you can avoid vacation-spoiling unpleasantries, like smelling sewage, melting in a treeless location, or suffering a power meltdown. Vacations are always best when you can focus on the real reason you took a break from your normal life.